Draft Residential Permit Parking Policy – 55% support; with 63% supporting a discount for pensioners. Will include provision for 3 permits per household. Unclear if RMS will allow the scheme or if all houses in a street are eligible for permits. Draft Car Sharing Policy – 57% of respondents support charging car share operators for their use of designated car vehicles parking spaces. Draft Long Stay Visitor Parking Policy – many of the respondents wrongly held the view that supporting this policy implies supporting the installation of parking meters in residential streets. Draft Parking Provision for Tradespeople policy – No changes to apply to this policy. 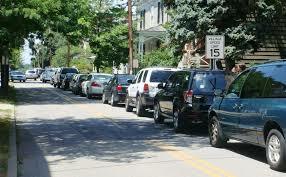 Draft Parking Fees & Charges Policy – There were no comments on this issue. There is no immediate consideration for the introduction of parking meters as this could be reviewed when the parking demand on streets exceeds 90% occupancy. Clr. Saville advised that the draft strategy has been referred back to Council Officers for clarifications to be addressed. At last night’s meeting of the Chatswood West Ward Progress Association It was moved, seconded and carried that the Association write to Council requesting that the Draft Parking Strategy be referred for consideration by the Willoughby Traffic Committee before being bought back to Council.